As the timer on the big screen at the front of the room counted down from 10 seconds, the students yelled in unison: “Seven. Six. Five…” The moment the display read “00:00,” they dove into their first coding challenge of the day. Huddled around computer monitors in teams of two, the students were tasked with navigating a virtual robot through a series of exercises, collecting objects (and points) along the way. Working together, they had to steer the robot toward a target, dragging and dropping blocks of code into place on the side of the screen to program the bot’s movements. The room buzzed with energy as the students got to work. Although only one student controlled the keyboard at a time, both teammates were engaged in solving the challenge at hand as they deliberated the steps they would have to take. 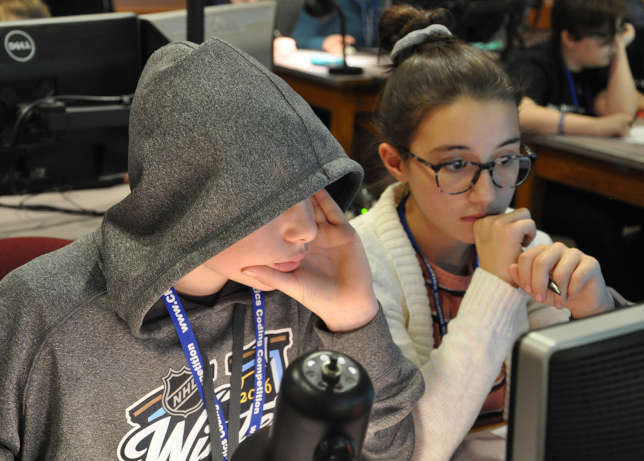 The students were competing in the finals of the 2018 New Hampshire Cyber Robotics Coding Competition, held Dec. 15 at the University of New Hampshire campus in Durham. Forty-four teams of middle and high school students from 22 schools around the state (and one from Massachusetts) qualified for the state finals after eight weeks of competition. The event was organized by the ISCEF Foundation in collaboration with New Hampshire-based company Intelitek, whose online CoderZ platform gives students an accessible way to learn coding skills. CoderZ features 3D simulations of robots operating within virtually constructed environments. Students write code to control the bots as they aim to solve various problems. A simulator feature allows students to test the code they’ve written to see if it works as intended. If they fail, they can go back and adjust their code as needed, working back and forth between their code and the simulator until they accomplish the task. The day began in jam-packed Cole Hall with competition master Trevor Pope addressing participants. “You’ve all come a long way since boot camp began Oct. 15,” said Pope, who is the customer success manager for CoderZ. After Pope described how the three-part finals competition would work, the 44 teams set up in computer labs around campus, with their teacher-advisors looking on. While the two-person teams were encouraged to work together, they were not allowed to use cell phones or external notes. In phase 1, students were given 60 minutes to complete up to 15 challenges of varying complexity. The harder the challenge, the more points it was worth. The challenges were set on a virtual farm. The first challenge, worth 100 points, was to move the robot in an arc to hit a target in the middle of a wide-open field. But the challenges got progressively harder from there. A 200-point challenge required students to navigate the robot out of a space enclosed by a fence. A 250-point challenge required them to time the robot’s movements just right so that it would pass through gates that moved back and forth. At the end of phase 1, a team from Monadnock Regional High School was in the lead, with 1,348 points. The top middle school team was from St. Thomas Aquinas School. Only three teams had completed as many as ten of the 15 challenges — and no team had completed more than that. “This is so much fun!” said one student as the competitors took their first break. “My brain hurts,” said another. The Cyber Robotics Coding Competition began last year in New Hampshire, with 2,600 students taking part across the state. This year, it has grown to encompass 37,000 students in 26 states — and another 30,000 students in Vietnam. In New Hampshire’s second year of competing, more than 4,200 students from 61 schools completed nearly 30,000 missions in the weeks leading up to the finals. At least a third of those competitors were girls. Phase 2 of the competition threw a curveball at students. Instead of running the simulator as often as they wanted to check their work, students were limited to just five attempts per mission. Making the task even more daunting was the multi-step nature of the missions. In the first one, students had to steer the robot around a fenced-in paddock in a series of precise movements, traveling in each compass direction and then returning to the center of the paddock in sequence. Having a limited number of tries with the simulator proved challenging. “I hope it works,” said one girl after she and her partner had arranged multiple lines of code. She clicked on the simulator button, and the robot began its trek — but then quickly stopped after bumping into the fence. A second try five minutes later also came up short. Fifteen minutes into the 20-minute time limit, the leaderboard at the front of the room refreshed — and the team from Monadnock High had become the first to complete the mission. “Three more minutes,” a teacher said from the back of the room. “Make sure you get some points,” another advised. With less than a minute left, a cry of “YES!” rang out as another team completed the task. But the leaderboard remained unchanged. As time expired, and the students filed into the hallway for another 10-minute break, one student stopped to chat with his teacher. “There was just this one point where it got off a little bit,” he said. “I like that you’re still smiling,” she replied. Frank Edelblut, New Hampshire’s education commissioner, said the Cyber Robotics Coding Competition “dovetails nicely” with the state’s investment in science, technology, engineering, art, and math education. In New Hampshire alone, Edelblut said, there is an abundance of computer-related workforce opportunities for graduates. In the competition’s final phase, dubbed the Ultimate Challenge, students had to navigate the robot around a vast space with objects scattered throughout. Hitting green blocks added points to their score, while hitting red obstacles subtracted points. In this open-ended mission, students could plot any course they wanted. Their goal: to collect as many points as they could in the 40 minutes allotted. While some teams spent time calculating an efficient route that would allow them to amass the most points, others just leapt in and started moving the robot around. Two minutes into the mission, the leaderboard began to change. A team from Litchfield Middle School vaulted into third place. With 30 minutes remaining, the leaderboard was turned off to build-up the suspense. Shannon McCracken-Barber, a STEAM educator at Farmington High School, brought two teams to this year’s finals. As students are completing the missions, “a lot of higher-order thinking is going on,” she noted. And despite what students think, coding isn’t just for the best and brightest. After lunch in the UNH dining hall, the students convened in the Paul Creative Arts Center’s Johnson Theatre for the awards ceremony. “We put you under a lot of stress with a lot of hard challenges to solve, and you all did a tremendous job,” Pope said. North Hampton Academy was recognized for having the highest percentage of its student population take part in the eight-week competition: 95 percent of the school’s students in grades five through eight competed. With 55 girls competing, Litchfield Middle School received the Grace Hopper Diversity Award for highest female participation. The award was named for the Navy admiral who helped invent the COBOL computer programming language. The bronze medal went to a team from Elm Street Middle School, with 1,658 points in the finals competition. Silver went to the team from Litchfield Middle School, with 1,728 points. The middle school champion was the team from St. Thomas Aquinas School in Derry, with 1,848 points. The high school champion was the Monadnock team, with 1,983 points. While these particular teams were honored during the awards ceremony, there were no losers.